Test for presence of voltage in live circuits. Tests AC/DC voltage from 80-250 volts. The neon indicator glows when voltage is present and brightens as voltage increases. Insulated housing and 2 inch test leads. Built in pocket clip. Tests DC motors, switches and outlets. With detailed user instructions. For testing electric circuits from 90 to 600 volt. Detects presence of power on either AC or DC circuits. Identifies circuit conductors. Tests AC/DC voltage from 5-50 volt. Glows when voltage is present and brightens as voltage increases. Insulated alligator clip tests leads. UL Listed. Carded. Tests standard receptacles and extension cords to ensure proper wiring. Neon indicators give positive indication of circuit status. Compact unit simply plugs into any standard 3-wire/grounded receptacle or extension cord (110 /125 volt circuits). Tests for six circuit conditions: open ground, open neutral, open hot, hot/ground reverse, hot/neutral reverse and correct wiring. Yellow and red lights provides indication of circuit status or specifies wiring errors. Large, dual, neon indicators acknowledge presence of voltage. Individual indicators for each voltage range assures reliability of testing. Probes snap on bottom of housing for single hand testing of outlets. Insulated leads and housing. Tests from 100 to 300 volt AC/DC. UL Listed. Three-way live circuit tester indicates 120, 240 and 277 volt AC. UL Listed. Sperry Voltage Tester, Single Range, 80 - 250 VAC/VDC, Yes, 32 - 104 deg F, ABS, cULus, CE Certified, 6 in Lead, For Indoor Applications Tests for breaks in non-energized wires or cords. 360 degree visual indication. Durable, heavy-duty tip. Flexible lead with insulated alligator clip. Pocket clip. Operates from 2 AAA batteries (included). Tests ground fault breakers by overloading circuit and tripping GFCI. Plug tester into any ground fault receptacle (110-125 volt AC) and press black button to overload circuit. Tests for seven conditions; ground fault interruption, open ground, open neutral, open hot, hot/ground reverse, hot/neutral reverse and correct wiring. Yellow and red lights provide indication of circuit status or specify which wire is defective. Carded. Economy continuity tester, tests continuity in nonenergized circuits. Features 36" insulated lead with alligator clip end. Fully shielded indicator bulb lights to indicate continuity, Uses 2 AA batteries, not included. Test continuity without wire probes on non-energized circuits. Tests AC/DC voltage from 12 to 250 volts on energized circuits. Glows when voltage or continuity exists. Uses 2 button batteries, included. UL Listed. Carded. Used to test DC voltage in automotive applications. Features 3' test lead with alligator clamp and 360 degree bright visual indicator. Durable ABS housing with pocket clip. Checks fuses in junction block, automotive circuits for voltage. Back probe connectors and sockets. No batteries required. LOW/GOOD indicator. Movable contact arm to fit AA, AAA, C, D, 9 Volt and 1.5 volt button cells. Tests from 50-600 volt AC. Visual (flashing) and audible (beeping) indicators signal presence of voltage. Built-in "safe test" feature to assure batteries are operating properly. Compact design with pocket clip to fit in shirt pocket. UL Listed. Compact, tests AC/DC voltage to 300 volt, DC current to 250mA, resistance to 1 M ohm, decibels from -20 to +56dB. Diode protected. With fuse overload protection circuitry. 250 mA fuse. Includes safety test leads and instruction manual. CAT Rating: II 300 volt. cETLus Approved. Contains the most common wiring tools and a voltage tester. Includes one No.GS-67 multi-function crimper/stripper, one No.CR-100 cable ripper and one GET-102 90-300 volt AC/DC circuit tester. 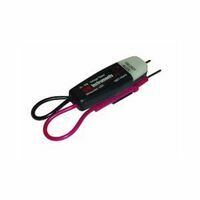 Use with CS61200 Sperry breaker finder to trace switches, light fixtures, and other energized wiring. Insulated leads, bulb socket adapter. Contains the most common circuit testers for convenient electrical troubleshooting. One each No. GCT-204 continuity tester, No. GRT-500 receptacle tester and No.GET-102 90-300 volt AC/DC circuit tester. For testing AC/DC voltage and current resistance. Low battery indicator. DC voltage 600. AC voltage - 500 volts AC. Resistance - 2 meg Ohms. Input impedance of 10 meg Ohms. Rated CAT 111 600 volts, cETLus and CE. Uses one 9 volt battery, not included. Holiday lights tester. Multi-purpose 12-600 VAC adjustable non-contact voltage tester with bulb and fuse tester, bulb puller. Bulb tester on the back tests both LED and incandescent light-string bulbs. Adjustable sensitivity non-contact voltage tester. 360 degree bright red light and an audible beeping indicate the presence of voltage. Requires 2 LR44 button cell batteries for operation (included). 7" height x 1.25" width x 1.2" length/depth. GB Analog Multimeter, 500 V, 250 mA, 50 k, -20 TO 56 dB Decibels, +/- 4 % Accuracy, Includes: Spare Fuse, ETL Listed, CE Certified, 6-Function, 14-Range Test GFCI receptacles and determine the appropriate wiring correction needed. Provides a clear and easy-to understand single LED readout indication for correct wiring or bad ground, open neutral, hot/gnd reverse, hot/neu reverse and open hot wiring errors. Includes a GFCI test function to test outlets wired in parallel to GFCI circuits (bathroom, kitchen and outdoor receptacles require GFCI protection). Hi-impact ABS housing with a 250 pound crush rating and the ability to withstand drops of up to 10 feet. Bright 360 degree viewable LED indicator light. Beeping audible indicator confirms test completion. 4" height x 2" width x 1.25" length/depth. Voltage-sensing long nose pliers cut wire and cable, crimp terminals and strip wires. Features over-molded, comfort grip, kurled plier nose and multi-purpose gripper, terminal crimping station and wire stripper for number 18 stranded and number 12 and 14 solid wire. With Cam-10 snap-in sensor to detect AC voltage without contacting live wires. Cuts wire and cable, crimps terminals and hammers staples. Over-molded, comfort grip, forged steel construction, features cross knurled jaws, built-in hammer head surface, terminal crimping station and precision hardened cutting blades. With Cam-10 snap-in sensor to detect AC voltage without contacting live wires. DualCheck non-contact voltage tester and GCFI outlet tester. GFCI outlet tester on one end and a 50-1000V AC non-contact voltage tester on the other. Features a bright 360 degree LED visual indicator along with an audible beeping indicator of the presence of voltage. Single LED readout indicating correct wiring or bad ground, open neutral, hot/ground reverse, hot/neutral reverse, and open hot wiring errors. 250 pound crush rating and the ability to withstand drops of up to 10 feet. 7" height x 1.38" width x 1.2" length/depth. Strips and loops cable, crimps terminals and cuts and rethreads bolts. With ArmorEdge stainless steel construction for nick-resistant blades, overall durability and maximum corrosion resistance. Strips solid or stranded wire. Bolt cutting station, knurled pliers nose, wire looping stations and dual grip positions for traditional or forward hand positions. With CAM-10 snap-in removable sensor in the handle to detect AC voltage without contacting live wires. UL Listed. Carded. Self-calibrating receiver with audible and visual indicators. Self-powered transmitter with audible and visual indicators. Working voltage range of 80-140 volts AC maximum to ground at 50-60 Hz. Operating temperature 32 to 122 degrees F. Storage temperature -4 to 158 degrees F. Power supply for the receiver is one 9 volt transistor type battery, not included. Transmitter is 3.3" height x 2.6" width x 1.1" depth, 2.5 oz. Receiver is 6.3" height x 3.4" width x 1.3" depth, 5.1 oz. UL Listed to both US and Canadian standards.